If you are looking to Enable USB Debugging on your Android phone with a stock firmware, or a CyanogenMod ROM or any other Custom ROM then here is a simple guide with Screenshots to make you understand easily that how to enable USB debugging. USB debugging is an important part for an advanced user who loves to root and install custom ROMs on their device or a developer. If you are wondering why do you need to enable USB debugging then move on to the next section to read more on this. – The name of the setting USB Debugging is quite self explanatory I guess. This option enables a user to access debuging options available on an Android phone whether it be a stock Android ROM or a CyanogenMod ROM or any Custom ROM. – USB debugging has to be enabled to be able to unlock the bootloader if you want to ROOT your phone or install custom recovery or install Custom ROM on your phone. 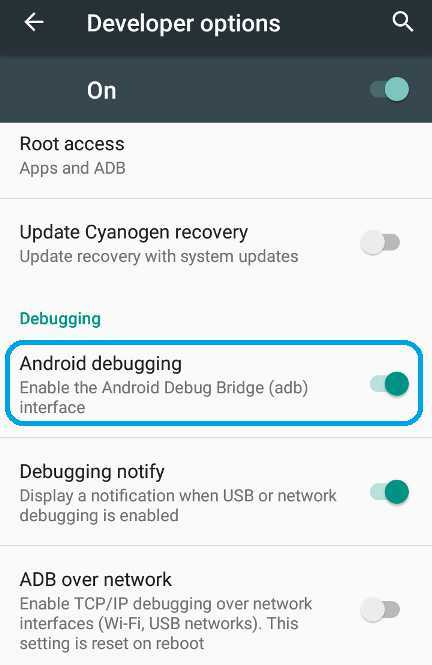 – Basically enabling the USB debugging option allows the adb and fastboot utilities to be accessible by your phone thereby allowing system modification. – If you are an Application developer or a kernel developer then USB debugging option is a must gateway for you. The USB Debugging settings are actually provided under Developer options in Android phones (whthere it be a stock Android or CyanogenMod ROM or any other ROM). Developer options are the same as comes in stock Android Devices. So, you need to Enable the developer option on your android device first. Go to Settings. Click on About phone and then Tap Seven times on the Build number. Here is a link explaining How to Enable Developer Options on Android or CyanogenMod or any other Custom ROMs. Now to enable USB Debugging, open Developer options and then scroll a little bit down on the Developer Options settings and look for the Android debugging setting. Enable it if it is disabled. Here is a screenshot of the Android debugging option. Again OEM unlock setting is also comes under Developer Options. But this option will not be available in any custom ROMs, also this is only available for the phones where the bootloader is locked, such as: HTC, Sony, Samsung phones etc. First Enable Developer Options if not enabled yet, then open Developer options, then scroll a little bit down on the Developer Options settings and look for the OEM Unlocking setting. Enable it if it is disabled. 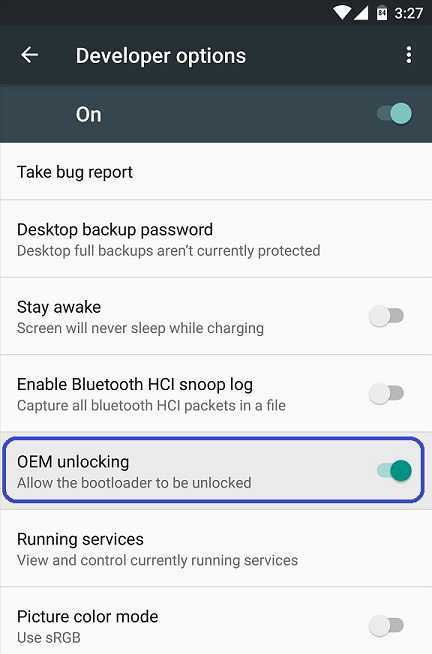 After enabling Android Debugging and OEM unlocking you may need to enable unlock Bootloader or Access ADB on your Android phone etc. depending on your scenario. Happy debugging. I have a problem the OEM unlocking option is not shown in the developer options. Do you know how to unlock that feature? There might not be an OEM Unlock option at all. It is not mandatory to have this option in all of the phones. and see if that command works ? 1. You need to get, create, download, or otherwise acquire a correct, well-formatted scatter file for your phone. If you have an older 32-bit Mediatek based ZTE, this is easy to do with MTK Droid Tools. If, like me, your phone has a newer 64-bit chip, you cannot use Droid Tools. But it’s not hard to do. I found a scatter file for MT6735M online (that’s the Mediatek in my phone). But I had to modify all of the addresses to match my phone exactly. I found the correct addresses in several places, and the fact that they all agreed was comforting: there was a badly formatted scatter file in the zte official update.zip ROM upgrade; I could do “adb cat /proc/emmc” without being root; and although Droid Tools was useless for my 64-bit chip, the debugging output log.txt prints out the entire partition table. 2. Armed with a good scatter file, you make what backup you can using SP Flash Tool. If you **** up, and you will, believe me, you will want these backups. 3. Now, you get a correct custom recovery.img for your phone. 4. And yes, it’s scary, but you download that custom recovery.img over the one in your phone using SP Flash Tool. This is way below the level of anything that a locked bootloader or not-being-root can prevent. The phone won’t know what hit it. 5.Voila — you now have a phone with TWRP or CWM recovery. And **it** just doesn’t care if you are bootloader-locked, or S-ON. It will let you flash the correct supersu.zip file to your phone. When you do this, you will be rooted. If you want t STAY rooted, then before you reboot normally, or shutdown, you MUST reboot once back into the recovery you just installed — and let the recovery modify the system partition as it wishes. Once you do this, you will be permanently rooted. Ohhh… I am sorry, I did not know that it’s an MTK based phone !! For further steps, follow the guide that I have linked above.